As the widely-admired CEO of Tyco International, Dennis Kozlowski grew a little-known New Hampshire conglomerate into a global giant. In a stunning series of events, Kozlowski suddenly lost his job along with his favored public status when he was indicted by legendary Manhattan DA Robert Morgenthau -- it was an inglorious end to an otherwise brilliant career. Kozlowski was made the face of corporate excess in the turbulent post-Enron environment when he was publicly castigated for his extravagant lifestyle. Kozlowski was ultimately convicted of grand larceny and other crimes that, in sum, found the former CEO guilty of wrongfully taking $100 million from Tyco. His life, once rags-to-riches success story, was irreversibly rewritten. Taking Down the Lion shines a bright light on the Tyco corporate scandal -- it is the definitive telling of a largely misunderstood episode in U.S. business history. 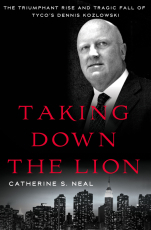 In an unfiltered view of corporate America, Catherine S. Neal reveals a world of big business, ambition, money, media and an epidemic of questionable ethics that infected not only business dealings but extended to attorneys, journalists, politicians, and the criminal justice system. When the truth is told, it’s clear the "good guys" were not all good, and the "bad guys" not all bad, and that chasing the American Dream can lead to a tragic end.